With both Jorge Powell and Austin Hardin dealing with injuries, the Florida kicker position is in a bit of a precarious situation. As such, head coach Jim McElwain has enlisted the help of the student body to come up with a replacement in the event that either Powell or Hardin can’t kick in the rivalry game versus Georgia on Oct. 31. Over 200 students have signed up for the open tryout on campus. While it isn’t known whether one has separated himself (or herself) from the pack, but a familiar face is pining for the job via social media. 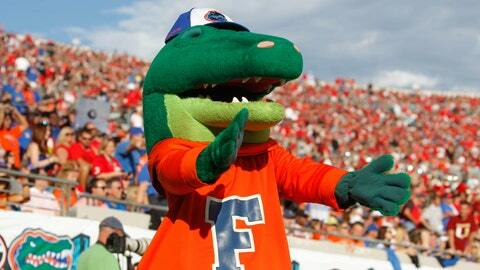 On his official Twitter page, Albert the Gator posted a video of himself nailing an extra-point attempt. Not only did he display solid form, but the kick sailed through the goal posts with plenty of power. Albert would likely be the first mascot to ever participate in an athletic event on the collegiate level (should he somehow win the job).